This is an introduction to basic yoga poses & healthy alignment. Here you will practice standing asana (poses) such as Mountain, Warrior 1 and 2, Triangle, Downward Facing Dog as well as seated poses. Each pose is broken down and the teacher will instruct the proper use of props to modify or deepen postures. Become more familiar with terminology, increase flexibility and strengthen — at a beginner's pace. 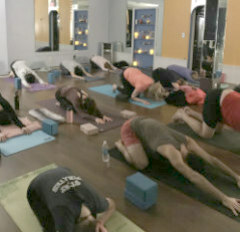 You will also learn to incorporate yogic breathing, meditation, and relaxation techniques – a great way to relieve stress. Please read: PLEASE NOTE: Students should bring a yoga mat although a limited number are available at the studio for student use.